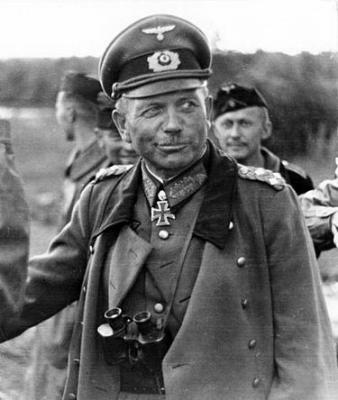 Guderian led the XIX Corps during the invasion of Poland. This corps comprised a panzer division and two motorized infantry divisions. Guderian led his corps in the Battle of Wizna and the Battle of Kobryn. In each of these his theories of rapid maneuver in combat proved highly successful. Following the completion of the campaign in Poland the armoured forces were transferred to the west to prepare for the next set of operations. The four light divisions had proved to have inadequate firepower, and they were brought up to strength to full panzer divisions, one of which was given to Erwin Rommel. With this change the total number of panzer divisions in the Heer stood at ten. Guderian continued to work in development of the panzer arm. Said Hans von Luck of the 7th Panzer Division in his memoir: "In the middle of February we were transferred to Dernau on the Ahr, hence practically in to the western front. Rommel visited every unit. He told us that he was proud to be permitted to lead a panzer division. Guderian too came to inspect and talk to us. 'You are the cavalry' he told us. 'Your job is to break through and keep going.'" In the planning for the Invasion of France, Guderian supported the change in the attack plan from a massive headlong invasion through the low countries to theManstein Plan shifting the weight of the armoured formations to the Ardennes. Guderian's corps spearheaded the drive and were through the Ardennes and over the Meuse in three days. He led the attack that broke the French lines atSedan, resulting in a general collapse of the French defenses. His guidance of the panzer formations earned him the nickname "Der schnelle Heinz" (Fast Heinz). Guderian's panzer group led the "race to the sea" that split the Allied armies in two, depriving the French armies and the BEF in Northern France andBelgium of their fuel, food, spare parts and ammunition. Faced with orders from nervous superiors to halt on one occasion, he managed to continue his advance by stating he was performing a 'reconnaissance in force'. Guderian's column was famously denied the chance to destroy the Allied forces trapped in thepocket at Dunkirk by an order coming from high command. In 1941 he commanded Panzergruppe 2, also known as Panzergruppe Guderian(redesignated on 5 October as Second Panzer Army), in Operation Barbarossa, the German invasion of the Soviet Union; becoming the 24th recipient of the Oak Leaves to his previously-awarded Knight's Cross of the Iron Cross on 17 July of that year. His armoured spearhead captured Smolensk in a remarkably short time and was poised to launch the final assault on Moscow when he was ordered to turn his army south in an effort to encircle the Soviet forces to his south in the Battle of Kiev. He protested the decision. Following the delay Guderian was ordered to make a drive for Moscow in mid-September 1941. With winter fast approaching, the effort seemed fraught with the risk of over-extending and leaving his command subject to counter-attack. He was ordered to proceed anyway. The offensive weakened and though several units under Guderian's command made it to the outskirts of Moscow, the city remained in Soviet control. The Soviets then launched a counterattack that sent the German forces reeling and threatened a general collapse. The Russian T-34 and KV-1 tanks' armor could not be penetrated by the German tanks' guns. Guderian was not allowed to pull his forces back, but instead was ordered to "stand fast" in their current positions. He disputed the order, going personally to Adolf Hitler's headquarters. The order was not changed. After returning to his command, he carried out a series of withdrawals anyway, in direct contradiction of his orders. A heated series of disputes withFeldmarschall Günther von Kluge, the commander of Army Group Centre, then followed. After a final clash with von Kluge, Guderian asked to be relieved of his command. On 26 December 1941 Guderian was relieved, along with 40 other generals. He was transferred to the reserve pool. Guderian's held hard feelings on the matter against von Kluge, whom he felt failed to support him. In September 1942, when Erwin Rommel was recuperating in Germany from health problems, he suggested Guderian to OKW as the only man suitable to replace him in Africa. The response from OKH came in the same night: "Guderian is not accepted"
Heinz Wilhelm Guderian (German: [ɡuˈdeʀi̯an]; 17 June 1888 – 14 May 1954) was a German general during World War II. He was a pioneer in the development of armoured warfare, and was the leading proponent of tanks and mechanization in the Wehrmacht (German Armed Forces). Germany's panzer(armoured) forces were raised and organized under his direction as Chief of Mobile Forces. During the war, he was a highly successful commander of panzer forces in several campaigns. He had major conflicts with Adolf Hitler over Hitler's interference in the management of the campaigns. This culminated in the German defeat before Moscow. He was placed in reserve until significant losses in the panzerwaffe made it imperative that he be brought back to rebuild it. A special position was created for him, and in February 1943 he became Inspector General of Armoured Troops. His efforts at rebuilding met with considerable resistance from Hitler himself. He was ultimately promoted to the highest rank in the army, Chief of the Oberkommando des Heeres, or Chief of the General Staff of the Army. By this point, however, Hitler had undermined the authority of the position, and Guderian was compelled to play the part of a figurehead for the last year of the war. Well done Reventer! Do Erwin rommel too!